Kimberly was born and raised on the Big Island. 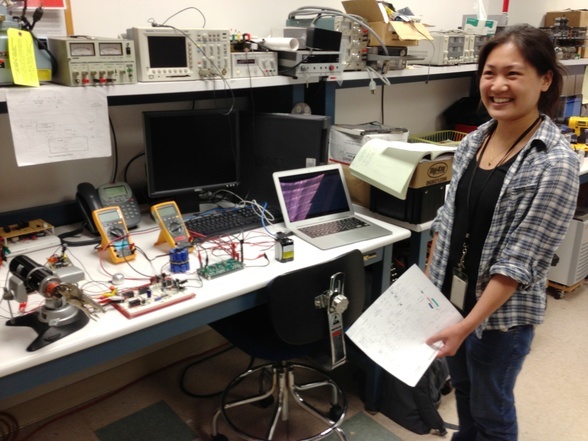 She is a graduate of Honoka‘a HS, and she developed her interest in engineering and technology through participation in her high school’s robotics club. Kimberly now attends the University of Portland, where she is majoring in Electrical Engineering, with a minor in Computer Science. She is particularly interested in renewable energy, robotics, and the design of digital systems. In her free time, Kimberly enjoys writing, and listening to and playing music. A Submarine Emergency Position Indicating Radio Beacon (SEPIRB) transmits data to rescue services in the event of an emergency occurring on a submarine. One drawback of the current SEPIRB design is that it has a relatively short 48-hour battery life. Trex Enterprises has addressed this battery-life issue by developing a prototype that harvests and utilizes wave energy to prolong the SEPIRB’s operation. In operation, a wave lifts a buoy attached to the top of the SEPIRB, which pulls against an opposing force provided by a submerged sea anchor. This pulls out an anchor line, which spins a generator to produce electricity. After the wave passes, an electronic retraction mechanism rewinds the anchor line for the next wave. We have designed, constructed, and tested a power-management system for the compact wave-energy machine, in which low-voltage DC power is distributed to various components, including a charging circuit used to recharge a 12.8-V LiFePO4 battery pack, a load simulator to represent the radio transmitter (the real SEPIRB radio should only be activated in true emergencies), and an electronic retraction mechanism. In addition, the power management system also provides battery power to a load-simulator circuit that represents the power needed for a radio transmitter. The load simulator switches on a 6-W load lasting approximately 0.5 s, once every 50 s, to replicate the power consumption features of the SEPIRB, and an LED is used to indicate when a simulated transmission would be sent. The electronic retract charge and load simulator circuits were constructed on breadboards and were tested independently for functionality. They were later integrated together, and all components operated properly when the system was tested for functionality. Other modules, such as a saltwater switch that activates the load-simulator circuit when in contact with ocean water, were added to the power management system, and the system components are currently being fabricated on to vector boards that will be placed in the prototype; the system will later be tested for functionality.